Achieving your greatest dream is the biggest achievement in anyone life and this special moment was captured with help of my instructor and my first phone.Today I want to share with you all about my first love and ultimate selfie which brings me million of smiles and pump my heartbeat.It is the selfie which cannot be compared with any other selfie moment of my life.Over the years I have taken many selfie with my family members,friends and superstars but this one is something which makes me motivated and emotional. Let me take you back a little with Story behind the happiness and events that took place on that special occasion and why it is my top selfie moment. Few years back,I was in sunshine state Florida for my pilot training course in order to become a commercial pilot which was big step to my dream to fly the commercial airliner.One of most important part of my training was getting my first solo flight sign off by the instructor and have the privilege to fly the Cessna single engine airplane and land the aircraft runway as Pilot in Command.After few hrs of flight training and ground school, my instructor thought that I was proficient enough to fly Cessna 152 and land it myself. 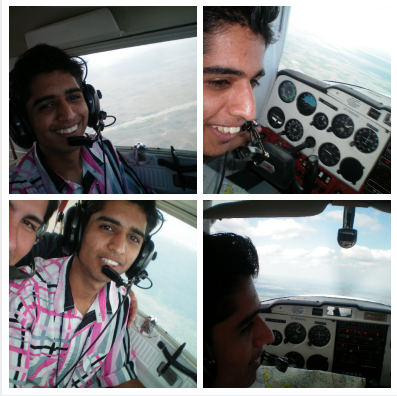 After a month of training,I was going for normal routine flight.I did the pre-flight checks and instructor told me that today will be your solo flight.While taxing the aircraft, my instructor told me important things and we did a two takeoff and landing circuit.After a small review, he was satisfied and came out of the plane.He asked me that I was ready to go solo now and fly the plane. At the point of time, I paused for a while and took the courage to say yes. 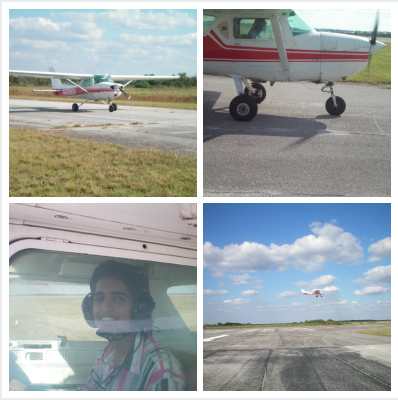 I taxied back to the runway and told the tower about my first solo flight.I could see from the window that my instructor was looking at my every move and smiling too. Then the call came from tower and I replied that I am ready to take off. I pushed the throttle forward and my focus on keeping the airplane straight on the centre of the runway.I did a small prayer thanking my parents and then I took off with pride and focused on my flying. Next followed the traffic pattern and answering the radio calls, I entered the final phase monitoring my airspeed and getting the landing checks done; I descended down and landed the plane on the runway center line. After landing, I pushed the throttle again and followed the pattern two times before making a soft landing to the runway and getting back to ramp. I could see the excitement and thrill in my instructor face when I came back.Then we went back in the air and I decided to take the ultimate Selfie with my Guru who was my first mentor to believe in my skills and flying the airplane. I have the ultimate selfie but the camera technology was not so much sharp and authentic those days and it was phone with 2 mega pixel rear camera.I wish I could have got better pictures but now all this is possible with upcoming new style and trendy smartphones from Mobiistar on Flipkart. They have come up phone comes with front, dual selfie camera that captures a 120° wide-angle shot.The best part is that you can get more clarity and clear selfie and front pictures with better focus on object. If you looking to for the ultimate selfie experience then wait is over as you visit them on http://mobiistar.in/ and also Mobiistar on Flipkart. Now share more memories with #mobiistar.